The entire Caramoan Peninsula is blessed with fine powdery white sand, beautiful lagoons, caves, limestone cliffs, and spectacular rock formations. It is also rich in marine life and thick forests. Region 5 Director Gilbert Gonzales of the Department of Environment and Natural Resources (DENR), in an interview, said there are four declared eco-tourism sites in the region -- the Mt. Bulusan National Park, Mt. 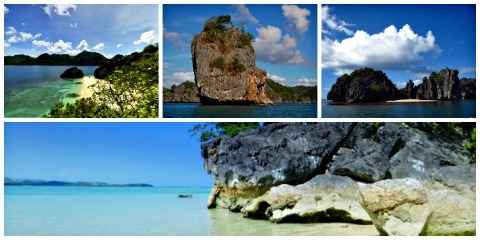 Mayon Natural Park, Bongsanglay Mangroves Natural Park, and the Caramoan National Park. Mt. Bulusan Volcano National Park is a 3,673-hectare protected area of rainforest. It is located at the South central part of Sorsogon Province, and bounded by five municipalities -- Bulusan, Barcelona, Irosin, Juban and Casiguran. There are three main peaks within the park -- the Bulusan Volcano, the highest of the three, which is characterized by numerous deep ravines and caves; Sharp Peak and the Hormahan. Its natural habitats include giant ferns and trees such as red lauan (Shorea teysmanniana), molave (Vitex parviflora) and many others. Other plant species including ground orchids and two endemic plant species -- Prenephrium bulusantum (fern) and Schefflera bulusanicum are also found in the area. Some animals are also found in the area, such as the Philippine baboon, Philippine Duck, Philippine Hawk-eagle, Flame-breasted Fruit-dove, Philippine Eagle-owl, monitor lizards, various endemic frogs, snakes and other reptiles. The Philippine Brown Deers, warty pigs and rare civets were also spotted in the area in the late 80's, although there are no evidence of their existence in the park at present. The park also supports endangered species of frogs, lizards, bats, snakes and other reptiles. The Mt. Mayon Volcano Natural Park covers a total area of 5,458.55 hectares, straddling the municipalities of Bacacay, Malilipot, Sto. Domingo, Daraga, Camalig, Guinobatan, and the cities of Tabaco, Legazpi and Ligao, all in Albay province. Mt. Mayon Volcano is the country’s most active volcano, yet, it continues to draw public awe and admiration because of its almost perfect cone shape. On the other hand, the Bongsanglay Mangrove Natural Park is one of the country’s remaining old growth mangrove forests and the only remaining primary growth mangrove forests in the whole Region 5 that needs to be protected. Its mangrove forest has the rare distinction of having all the three species of the mangrove family Sonneratiaceae -- pagatpat (Sonneratia alba), pedada (S. caseolaris), and pagatpat-baye (S. ovata), which is said to be the rarest of the three Sonneratia species. Bongsanglay Mangrove is characterized by unique species of mangrove trees and shrubs that fringe the intertidal zone along sheltered coastal, estuarine and riverine areas. These characteristics also play essential role in the defense of the coastal zone, their role in carbon sequestration, and the increased risks posed by the predicted rise in sea level. The biodiversity of the park supports numerous important wetland communities of plants and animals. Thus, the need to protect it is essential. Caramoan has gained popularity because of the hit TV series Survivor which has made the islands a favorite host to its shows. To date, about 12 Survivor series have been shot in this island paradise and they are now preparing for its 13th series which will begin this May. Caramoan is considered one of the tourism gems of Bicolandia with its powdery white sand beaches and sand bars, and island adventures such as kayaking, scuba diving and rock climbing. Beach and island hopping around Caramoan group of islands is a must -- from Sabitang Laya, Manlawig Sandbar, Cotivas, Lahuy, Gota, Matukad, Pitogo, Minalahos, Hunongan, Tinago, Haponan, and Basod -- to fully appreciate its magnificent views. Gota Village Resort, which is located in one of the islands of Caramoan and being operated by the provincial government of Camarines Sur, was adjudged eco-tourism destination of the year and included among the 14 best tourism destinations in the world by Top Resa 2008 in Paris. It has also earned for the Philippines the accolade as "Eco-tourism Destination of the Year" in the 2009 edition of Nature, one of France’s biggest travel fairs. However, like any other eco-tourism sites across the country, they are threatened by several cases of unlawful activities and problems. Such activities include the illegal mining in the declared eco-tourism site which caused the death of four workers in a gold panning site within Lahuy Island. DENR-RED Gonzales said small scale mining activity in the island started around December 2013. Based on existing environment laws, no mining activity should be done in a declared national park. He assured the incident was an isolated case and won't affect the tourism industry as authorities are now investigating the issue. Environment and Natural Resources Secretary Ramon J.P. Paje, for his part, said the Philippines remains committed to promoting eco-tourism as a means to further economic growth without sacrificing the environment. Paje said the Philippines under the Aquino administration is committed to promoting eco-tourism as a driving force for sustainable development.